Terminal del Guazú is located on the left coast of Parana Guazú River , at Villa Paranacito Municipality area (head of the Islas del Ibicuy Department), in the southern part of the province of Entre Ríos. There are no industries or other activities. 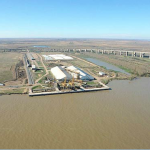 It is located at km 113 of the National Highway Nº 12 which connects it to the north with the Mesopotamia and south to the greater Buenos Aires area and the Pampa region. The terminal is connected to the Mesopotamico railway system. Multi-purpose terminal owned by del Guazú S.A, situated on the left bank of the Paraná del Guazú river. BERTH: the berth consists of one continuos quay made of reinforced concrete, total frontage 200 m, with six rubber fenders, connected to shore by four viaducts; depth alongside 11,30 m (37 ft) to datum. Suitable for vessels up to LOA 260 m ; Panamax and Cape-Size vessels have berthed. Grain storage capacity 80.000 tons in two cells 40.000 tons each. Grain (wheat, soybean and corn) and by-products are loaded via two moving towers stepped on the pier, with loading arms; no shifting necessary. Loading rates for grains 2×1200 TPH, when loading from both storage cells. Also bagged rice (each 50 Kg) can be loaded with ship´s gear. Pipelines (1×8″ and 2×6″) are laid at pier, for oil or chemicals operations from and to Voxen S.A., near Del Guazú premises (see note below). At the premises, two grain discharge platforms for trucks, at 600 TPH rate; and one rail-wagon discharge platform, can unload two wagons simultaneously at 600TPH rate. One warehouse 2000 sqm available, for general cargo and forestry operations. A 20000 sqm parking area is available for abt. 200 trucks, with weighting facilities (2 weight scales). 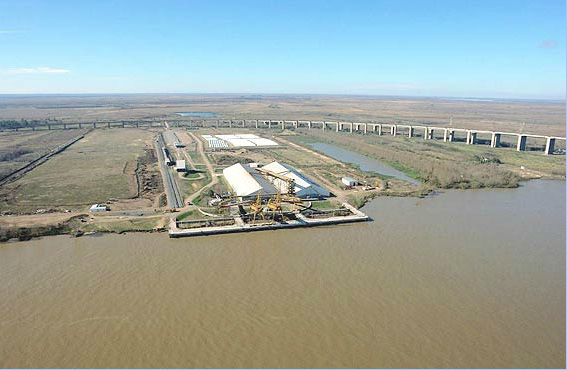 There is a 50.000 sqm semi-enclosed dock located downstream, with a draft of 10 m (33ft); facilities are under construction; it will receive barge convoys at any given time;the basin will be fitted with one gantry type crane, providing an unloading 300 ton per hour rate (depending of cargoes types). The terminal is taking full advantage of its connection to the railroad system (Ferrocarril Mesopotámico) and highways nearby. Customs delegation at the the premises. Note: As said, Voxen SA located next to the terminal, operates various carbon steel tanks with storage capacities 13,500 cbm for mineral oil and 6,000 cbm for vegetable oil. The tanks are connected by pipelines 1×8 “and 2×6” to Del Guazú pier for loading / unloading. Port pilot is requested by agents from Campana well beforehand so that pilot´s transport may be arranged. Paraná river pilots are requested from Buenos Aires. Available at Zárate city, abt 30 km by highway an bridges. One small local hospital at Ibicuy , 40 km by road and a small First Aid facilities at 6 km; ambulance available. Should be requested in advance, from Buenos Aires, Zárate or Campana.